Redbubble is an online marketplace for artists. It outsources many of its functions. Its artist-vendors “are automatically connected with a third-party manufacturer to make the goods.” Redbubble also uses third-party services to package/ship goods and process payments. It appears much of this outsourcing is invisible to buyers; allegedly “When an item from redbubble.com is shipped, ‘the Redbubble name and logo does appear on the packaging that products are shipped in; the name on the return address label is ‘An Artist at Redbubble,’ and the return address itself is Redbubble’s.’ Some items are also ‘shipped with a ‘hang tag’ containing the Redbubble logo that is designed to be removed before the garment is worn. '” It appears everyone agrees that artists are selling items that infringe OSU’s trademarks. 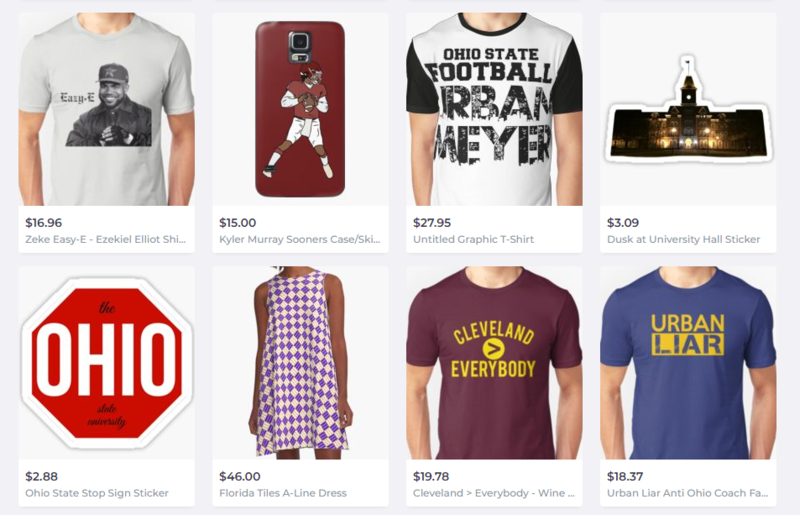 OSU sued for trademark counterfeiting, violation of Urban Meyer’s publicity rights, and more. Redbubble defended on a lack of trademark use in commerce. When I saw this, I nearly plotzed. In the mid-2000s, many trees and electrons died in fierce academic and practitioner battles over what constitutes trademark “use” online. Much of that battle faded away after the Second Circuit’s tortured Rescuecom v. Google opinion, which didn’t clarify much but did make it clear that selling keyword ads was a trademark use. Surely we’re not going to reinvigorate the trademark use battles, are we? Why, yes we are. The court starts out non-controversially, saying it’s “well-established that selling an item constitutes ‘use. '” In contraposition, “a transactional intermediary is not treated as a seller,” with the example of a showroom that acted as a broker, not a direct seller. OSU only alleged direct trademark infringement, not contributory infringement, and the court says that makes Tiffany v. eBay less relevant. Redbubble is not liable for direct infringement on these facts. The caselaw sets up a spectrum against which to measure Redbubble’s conduct. At one end are companies that function like auction houses and are not liable for direct infringement. At the other end are companies like CafePress and SunFrog that themselves manufacture and ship infringing products to the customer. Redbubble does not fit neatly into either of these categories. But Redbubble’s actions put it closer to the auction house side of the spectrum than to CafePress. 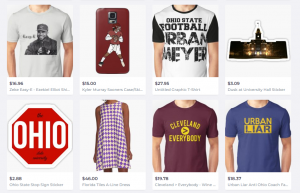 Redbubble essentially offers to “independent artists” an online platform through which to sell their goods and access to Redbubble’s relationships with manufacturers and shippers. Redbubble is not directly producing the goods nor, like SunFrog, is Redbubble maintaining a design database and then placing the designs onto goods that customers order. OSU tries to backdoor the issue by arguing that Redbubble still publishes ads for the infringing goods. The court says that the artist-vendors, not Redbubble, display the trademarks on the service. what is trademark use online? It seemed unusually defense-friendly to equate “use” and “sale,” with only the breezy reference at the end that the artist-vendors are displaying the trademark in their advertising rather than Redbubble. what duties do print-on-demand vendors face for manufacturing goods that contain third party copyrights and trademarks? The caselaw on this front has been terrible for the vendors, yet Redbubble successfully avoided that caselaw through its manufacturing subcontracting. when does an online marketplace become a retailer? The court closely ties this issue to the chain of title, which makes sense but also is defense-favorable. more generally, what is the allocation of liability/responsibility between online marketplaces and their merchant-vendors? Here, Redbubble successfully points the finger at its artist-vendors and its contract manufacturer(s), shedding responsibility for being in the middle. Though this result is a major win for Redbubble and possibly other online marketplaces, the procedural posture leaves open several key liability questions. First, and most obviously, if Redbubble isn’t the seller, does that leave its contract manufacturers as the culpable party for direct trademark liability and possibly counterfeiting? If so, those folks are going to exit the industry ASAP because they face all the legal risk without all of the economic upside. Second, does this ruling leave the artist-vendors on the hook legally? The IP owner has a harder time chasing all of them down in court, but a litigation campaign could successfully drive those artist-vendors out of the marketplace. Finally, if either the contract manufacturers or the artist-vendors are legally responsible for trademark infringement, will Redbubble face contributory trademark liability? The court emphasizes that OSU didn’t allege contributory liability, but that’s easy enough to correct in future litigation. So a ruling negating direct infringement only tells part of the legal story necessary to clear the activity. This ruling won’t be the last stop in that story. Though Amazon wasn’t a defendant in this case, the ruling is fantastic news for its online marketplace. The court treats it as well-accepted law that Amazon isn’t the legally responsible “seller” of the goods by marketplace vendors. More on that below. BONUS: Garber v. Amazon.com, Inc., 2019 WL 1437877 (N.D. Ill. March 31, 2019). This case involves property damage caused by a hoverboard sold in the Amazon Marketplace. The buyer sued Amazon as a “co-seller” of the hoverboard, claiming both strict liability and negligence. every other court to consider the question of Amazon’s liability has concluded that Amazon is not liable for defective products sold on its marketplace. See Carpenter v. Amazon.com, Inc., No. 17 C 3221, 2019 WL 1259158, at *4-6 (N.D. Cal. March 19, 2019) (applying California law); Stiner v. Amazon.com, Inc., No 17CA11215, 2019 WL 757822 (Ohio Ct. App. Feb. 19, 2019) (applying Ohio law); Eberhart v. Amazon.com, Inc., 325 F. Supp. 3d 393, 397-400 (S.D.N.Y 2018) (applying New York law); Allstate N.J. Ins. Co. v Amazon.com, Inc., No. 17 C 2738, 2018 WL 3546197, at *5-12 (D.N.J. July 24, 2018) (applying New Jersey law); Fox v. Amazon.com, Inc., No. 16 C 3013, 2018 WL 2431628, at *8 (M.D. Tenn. May 30, 2018) (applying Tennessee law); Erie Ins. Co v. Amazon.com Inc., No 16 C 2679, 2018 WL 3046243, at *1-3 (D. Md. Jan. 22, 2018) (applying Maryland law); Oberdorf v. Amazon.com, Inc., 295 F. Supp. 3d 496, 599-501 (M.D. Pa. 2017) (applying Pennsylvania law); see also Milo & Gabby LLC v. Amazon.com, Inc., 693 F. App’x 879, 885 (Fed. Cir. 2017) (holding that Amazon is not a “seller” under the Copyright Act, 17 U.S.C. § 106). To the extent the Illinois Supreme Court would consider the laws and judicial opinions of other jurisdictions, “it would encounter an emerging consensus against construing Amazon as a ‘seller’ or ‘distributor’—and, therefore, against holding Amazon strictly liable for defective products sold its on its website.” Eberhart, 325 F. Supp. 3d at 400. The negligence claim doesn’t fare any better. Amazon doesn’t have the duties of a manufacturer, nor does it have general duties to warn customers.